St. Cloud Soo Bahk Do® martial art school owner, Master Bill Nelson, his students and supporters hosted a Kick-a-thon fundraiser Wednesday, July 30th, 2014 to benefit the nonprofit United States Soo Bahk Do Moo Duk Kwan Federation and Foundation. Thirty participants included beginner students (Gups), black belts ( Dans) Masters (Ko Dan Ja), non student children and adults. Participants executed over 6000 kicks during the one and one half hour event and generated $2000 in donations from their generous sponsors. The event was organized well and was followed by a cook out and pot luck dinner. St. Cloud Soo Bahk Do®members from Milaca and Becker raised $2,000 while reporting they had great fun and enjoyed the unique training opportunity provided by the Kick-a-thon. Students and supporters expressed satisfaction knowing that they were helping raise funds to preserve the Moo Duk Kwan® martial art school's well established reputation and legacy of nearly 70 years while supporting the promulgation of the strong core values the Soo Bahk Do® martial art system emphasizes. Organizers said the Kick-a-thon was very easy to plan and organize with the support materials and other resources provided by the Federation. The Kick-a-thon packets contained ready made sponsor forms, envelopes, detailed execution of gaining sponsors, with prizes and incentive for all who participate and generating student interest and participation was easy. 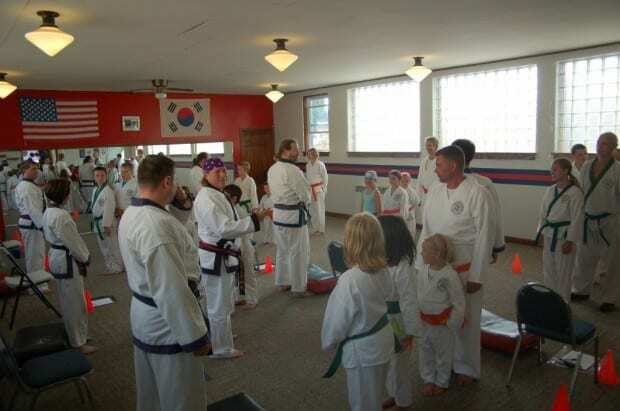 Sa Bom Nim Nelson stated that raising money was never so easy and he encourages each Moo Duk Kwan® studio to take action and host a kick-a-thon or break-a–thon before year end when the Grand Prize expires if not claimed.